This recipe is extremely easy to do and makes a quick but delicious chicken curry. If you want you can definitely make your own Garam Masala but if you ever find a good one I would make sure you stock up because it’s nice to have something like that around. I have a specialty spice store near me, so I always use theirs. Before we go into the recipe we’re going to go over a little background information about Garam Masala. In case you are unfamiliar, Garam Masala is the “market blend” of spices sold by vendors. It’s kind of like their own special curry powder, but infinitely better. Really you could use a curry powder for this recipe but I wanted to list Garam Masala in the ingredient list because it’s very important that whatever you use is of a really good quality. … the best way is definitely to get all the spices separately (even better in seed form) and grind them yourself. Alton Brown of Good Eats fame (I realize he’s been in a lot of other shows but Good Eats is his best show by far, watch it if you haven’t) recommends having a “Curry Kit” ready with all the different spices ready so you can make different spices blends for each different dish. The episode in question is called “The Curious Case of Curry”, I would recommend watching it to learn more. In fact on the IMDB page for the episode you can see Alton with his “Curry Kit” as the featured image. While I haven’t build up a good “Curry Kit” quite yet, it is best practice if you eat a lot of curry. I will eventually build one some day soon. So in the end I obviously realize this is not an authentic or traditional Curry by any means. What it is though, is a easy to make supper for any night of the week that definitely tastes different than your every day meat and potatoes. With all of that out of the way let’s get started. 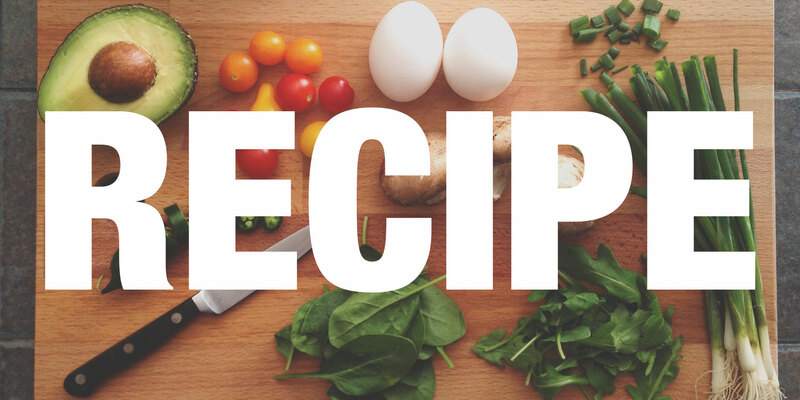 This recipe is extremely quick so I recommend getting all your mise en place ready before you start. Have your chicken, onion, garlic and tomatoes (optional) chopped. Grate your frozen ginger and have your milk/stock and yogurt measured and ready to go. Also make sure you make a slurry with your corn starch by adding it to about 1 1/2 Tbsp of water and mixing well. By doing this you’ll ensure the corn starch slurry mixes in with the sauce and you don’t get clumps. In case you’re wondering about the frozen ginger thing from above, that’s how I handle most of my ginger now. I simply buy it, get the skin off of it with a spoon and then grate the frozen ginger into my dishes. It lasts forever in the freezer and I don’t think you lose too much flavor. I’ll admit it’s not quite as good as fresh but in the grand scheme of plus/minus I think this method is definitely worth it. Cook your chicken however you see fit. I personally usually flatten my chicken out and grill it hard and fast on the BBQ then cube it up after it’s done cooking. I find the char works really well with this dish. Get a wok on the burner and preheat it on medium heat. Cook the Onions for about 5 minutes in the wok with a little bit of butter and oil olive. Combining fats is the best. The onions should be soft and while they can have a little color, try not to brown them too much. Add the garlic and ginger and your Garam Masala. Turn the heat to high and cook for about a minute. Add your 1 cup combo of milk/stock. The reason up until now I’ve been saying milk/stock is you can use a combination of both or just one or the other. I personally like to use a 3/4 cup of stock and 1/4 cup of milk, but you do what you want. You could also add yogurt instead of milk for a more authentic curry, but to be honest I don’t eat a lot of yogurt but I do drink a lot of milk so I always have some on hand. If you did add the yogurt instead of milk I would probably skip the corn starch slurry as well. The yogurt is thick enough on it’s own to make the sauce a good consistency. Cook the milk/stock until it begins to bubble. Add your corn starch slurry and mix well. The slurry will ensure you have no lumps most likely but it’s still a good idea to mix everything up well. Turn the mixture down to a simmer and cook for about 5 minutes or so. Add the cubed chicken and any optional ingredients to the curry. Cook for about a minute so everything is heated through. I really like to do frozen peas with my curry. Serve curry over rice. Garnish with yogurt marbled with hot sauce and cilantro (authentic) or green onion (not authentic but delicious). The one thing I will say is that I added the tomatoes after making the dish because it could really use a little more color. Something like pepper would probably work too but I think tomatoes would taste the best. 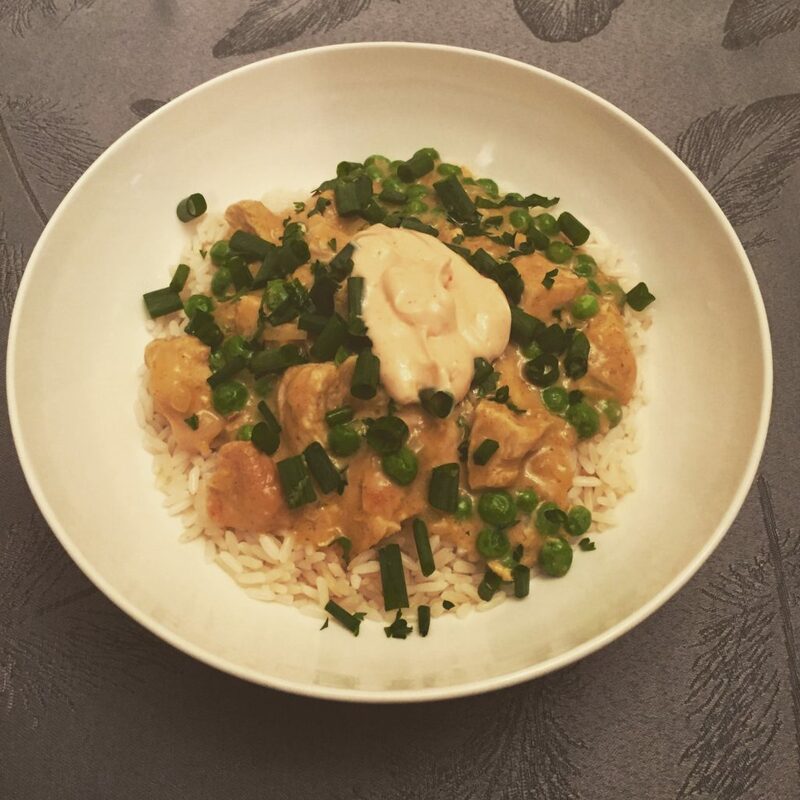 If you make your own version of this curry or any others please let us know in the comments and attach some pictures!